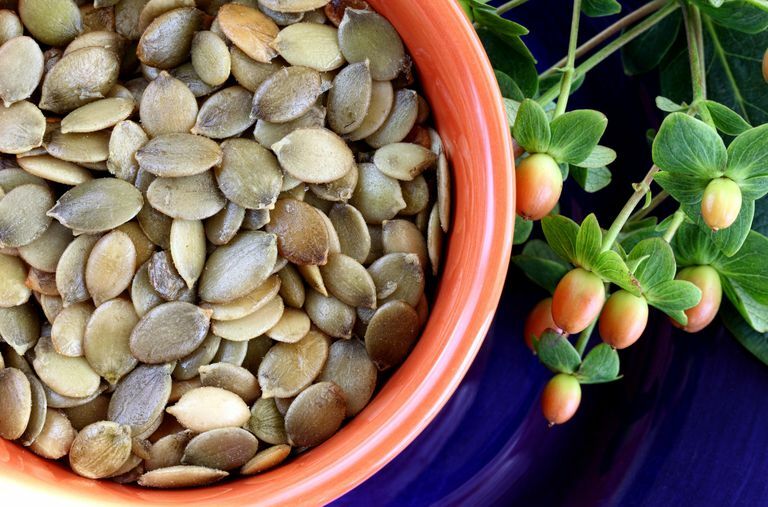 Pumpkin seeds (also known as pepitas) are delicious roasted and can be eaten either with or without the hulls. You may have seen the flat, dark green pumpkin seeds available at your local grocer, but unshelled pumpkin seeds are what you'll use in this roasted pumpkin seeds recipe. This recipe also works for squash seeds, including the beloved spaghetti squash. Add nutritious roasted pumpkin seeds to a trail mix, toss into salads, or make a hearty granola. Of course, they are also delicious on their own as a snack. Preheat oven to 350 F (or see below for lower slower method). Cover a baking sheet with parchment paper. Toss pumpkin seeds with olive oil in a bowl. You only need enough oil to barely coat the seeds; otherwise, they will be greasy. Add salt and toss again. Spread the seeds out in one layer on prepared baking sheet. While this recipe is simple, you can add your own herbs and spices to give your pumpkin seeds some pizazz. Go savory with spices like smoked paprika, cumin, or garlic. Add sweetness with cinnamon, ginger, clove, or nutmeg. Another way to boost the flavor of your roasted pumpkin seeds is by boiling them in salt water before roasting. Doing this allows the salt to get inside the shell to the seeds. Simply add pumpkin seeds to a medium-sized saucepan with 2 to 3 tablespoons of salt (depending on your taste preference) and 2 cups of water. Bring to a boil and lower heat to simmer for 10 minutes. They should look slightly gray when they are done. Use a strainer to drain the water from the seeds completely and roast the pumpkin seeds using the recipe above. Pumpkin seeds are packed with nutrients. They are particularly high in many minerals, including magnesium, zinc, copper, manganese, and potassium. They are highest in zinc if you eat them whole, including the shell. They also contain a wide array of phytonutrients, including lignans and many antioxidants.